The U.S. Securities and Exchange Commission (“SEC”) settled charges against two individuals for the promotion of a pyramid scheme and the misappropriation of investors’ funds. The individuals were doing business as Vizinova. The two individuals incorporated Vizinova in Mexico, using Mexican nationals as nominees. Neither the individuals nor Vizinova were registered with the SEC. 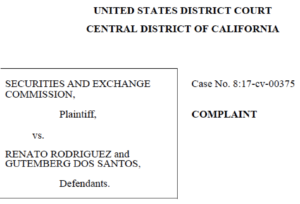 In its court Complaint, the SEC accused Renato Rodriguez of Downey, California, and Gutemberg Dos Santos of Las Vegas, Nevada (the “defendants”), of running a pyramid scheme out of Southern California. The defendants’ intention was to defraud investors through Vizinova. According to the Complaint, Rodriguez and Dos Santos promoted Vizinova as: (1) a multilevel marketing scheme, and (2) a wholesale reseller website. Rodriguez and Dos Santos allegedly enticed investors to purchase “points” in Vizinova, with the opportunity to purchase application software (“apps”) and other software at wholesale prices from Vizinova. Depending on the level of an investor’s points purchases, the investor could open “stores” on Vizinova’s website. Through those stores, an investor could then resell the apps and software to retail customers for a share of the profits. An investor’s profit share percentage depended on the size of the investor’s original investment in Vizinova. However, according to the Complaint, virtually no products existed and few sales were ever made. Furthermore, Rodriguez and Dos Santos diverted a large percentage of investors’ money into personal holding companies. They then used that money for their own benefit, such as the purchases of homes and expensive luxury cars. The SEC also alleged that Rodriguez and Dos Santos enticed investors through what they represented was a multilevel marketing scheme. Vizinova investors were given an initial number of points that they were told could be redeemed at a later time for a profit. Investors were told they could accumulate more points by recruiting additional investors to Vizinova. The more new investors an original investor recruited, the more points he/she would receive, and the more valuable each point would become. Investors were supposedly told that at some future redemption period, they could redeem their points for merchandise or covert them to cash. In order to receive cash, investors were told that they would have to purchase a prepaid debit card from Vizinova for $49. According to the Complaint, Vizinova had no substantive business, and “very few products existed or were purchased or sold.” The “points” were worthless and would never be redeemable. As set forth in the Complaint, from September 2013 to September 2014, Rodriguez and Dos Santos raised approximately $5 million from roughly 100 investors. They misappropriated almost 30% of that amount (approximately $1.8 million) for their personal use.